Saudi Arabia, the birthplace of Islam and the protector of two holiest mosques in Islam, is in abject decadent state. It claims to be the holiest place in Islam, but at the same time it ferments internecine conflicts within Islam. It spent more than 50 billion dollars over the past 45 years or so promoting a fundamentalist religious ideology called Wahhabism throughout the whole world. At the same time, it spent untold hundreds of billions of dollars in aiding and abetting Jihadism and supporting terrorist groups like al-Qaeda, ISIS/ISIL, Taliban, al-Shabaab, Boko Haram and so forth against the ‘infidels’. The duplicity of Saudi Arabia is just unimaginable. To understand Saudi duplicity properly, one has to look back at the root of Saudi monarchy and its proclaimed legitimacy. After Abdulaziz ibn-Saud conquered Riyadh and established the 3rd Saudi State in 1902, he needed the religious legitimacy to further his political ambition to conquer the fractious regions of Arabia. He revived an alliance drawn between Mohammad ibn Saud (the founder of 1st Saud dynasty) and the preacher Abd-al Wahhab in 1744 whereby ibn Saud and his heirs would use and promote Wahhabism in exchange of retaining the proprietary right over this Wahhabi ideology and giving protection to Wahhab dynasty. This Wahhabism is an extremely virulent form of fundamentalism, intolerant to other religions or even towards other denominations of Islam itself. Nonetheless, it suited Abdulaziz (the founder of the present day Saudi Arabia) and his band of warriors to rule over Arabia in the name of Islam. Saudi Arabia, since its inception at the early part of last century, had kept its promise of promoting Wahhabism and contributed financially in establishing mosques, Islamic congregations, Islamic schools, madrassahs, Islamic centres and so forth throughout the whole world. In some developing countries, Saudi Arabia had managed to have absolute free hand, in exchange of large donations to the governments, to propagate Wahhabism and to establish Sharia Laws. Islamic schools, colleges, universities, Islamic banks, Islamic medical centres etc. proliferated in those countries. Alongside those apparently innocuous humanitarian and economic activities, there were covert political activities when Muslim Brotherhood, Jamaat-e-Islam, Taliban, Laskhar-e-Taiba etc. were also established. The aims were to wrest political control and establish Islamic states whereby Sharia Laws could be enforced. Needless to say, political objectives without military backup are like tigers without teeth and claws. While all these activities were going on under the banner of Islam, Saudi Arabia had tacit understanding with Israel to fight jointly against Shia forces in the Middle East – in Lebanon, Iraq, Syria and other countries. Israel might have taken Muslim Palestinian land, but that did not bother Saudi Arabia at all. However, occasionally they felt the need to shed crocodile tears. If the Saudi-Israeli ‘détente’ can decimate Iran, Saudi Arabia and its Wahhabism would reign supreme in the region. The recent spawning of ISIL/ISIS from the ruins of so-called Arab spring in Syria had been actively supported not only by Saudi Arabia but also by other Gulf Cooperation Council countries (Bahrain, Kuwait, Oman, UAE, Qatar and Saudi Arabia). What can be better than having a band of vicious Jihadi fighters doing their bidding in promoting Wahhabi ideology? Subsequently realising the adverse reaction worldwide to the beheading of innocent civilians by barbarian ISIS Jihadists, Saudi Arabia pulled back a little from its overt support. Under American pressure, the country had even reluctantly given access to their airspace by American bombers and sent two of their fighters to bomb ISIS targets! Nonetheless, money and military hardware are flowing from the GCC countries unabated to ISIS. Saudi Arabia is definitely looking both ways. The Syrian war, sectarian killings in Iraq, Afghanistan and Libya, war in Yemen are all directly or indirectly funded and militarily aided by Saudi Arabia. 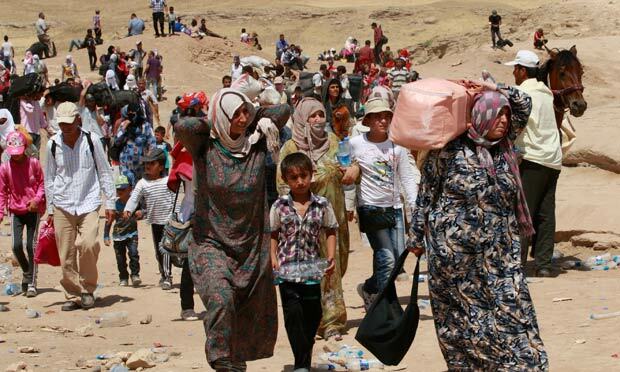 Hundreds of thousands of Syrians had fled from their homes and hearths and became refugees in the neighbouring Lebanon, Jordan and Turkey. After years of suffering these unfortunate people – victims of the Wahhabism – had to undertake the most perilous journey across the Mediterranean to reach European shores. Although some of these ‘refugees’ may have the blood of ‘infidels’ in their hands, but European libertarian conscience gave them food, water and shelters. But what Saudi Arabia with hundreds of billions of petro-dollars in their coffers and vast uninhabited lands is doing to help these refugees? Zilch, nil. Not a single person from the war-torn regions of the Middle East had been given sanctuary in Saudi Arabia. Saudi Arabia may be the instigators of these wars encouraging block-headed morons to fight the religious wars, but they are not prepared to help the refugees an iota. Religion is to them a political weapon to be used to their advantage. Although Saudi Arabia is not helping these refugees with food and shelter, it had been reported that the Saudi King is willing to fund up to 200 mosques in Germany. Thus the king is proposing to perpetuate the practice of poisonous religious beliefs, which forced these refugees to leave their own homes in the first place. Saudi vulgarity, duplicity and inhumanity are mind-boggling and unimaginable. This after-life spread is very tempting and going viral as well.What is on offer is motivating the faithful to deny themselves and others the rights to live and let live.This virus has and is damaging the irrational minds of the faithful at an alarming rate. Your comment reminds me what Avijit called the ‘virus of the mind’. Once that religious virus gets into the mind, everything else becomes redundant, one only thinks about the returns in after-life – wine, women, unimaginable luxury for ever and ever. What actually happens is that mind becomes damaged by this virus for ever and ever. I read somewhere that the Saudi authorities claim to have given shelter to hundreds of thousands of refugees from Syria. No international organization seems able to confirm this. Apparently the claim is a lie. About their love of humanity, I do not think the concept ever cross their minds. I don’t know when the West will understand the actual impact of Wahhabism? Yes, we are living through Jihad now. You can’t make understand even any educated Muslim about the duplicity of Saudi Arabia. He not only believes in fictitious Allah and war monger Mohammad, but also in anything Saudi. The moment he will disbelieve Saudi, Islam will crumble down.